Danish born Mathias B. Pontoppidan is a corporate strategist who has worked in India since 2012 through various capacities in the investment ecosystem - from hedge fund investment management and orchestrating M&A and private equity transactions, to India market-entry advisory to foreign corporates. Mathias was in 2016 the youngest to be ranked among the top 50 of Danish leadership talents in the newspaper 'Finans'. Mathias' passion for India derives from a deep conviction in India's long-term growth narrative and he is an enthusiastic promoter of strengthening India's free-market edge and providing perspectives on why India should resist the temptation to grow government reach and authority. 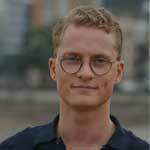 Mathias holds a BA Honour degree in Global Marketing from the University of Greenwich (London), and an IBB Global degree from Niels Brock Business College (Copenhagen) where one semester was studied at RMIT University (Melbourne).